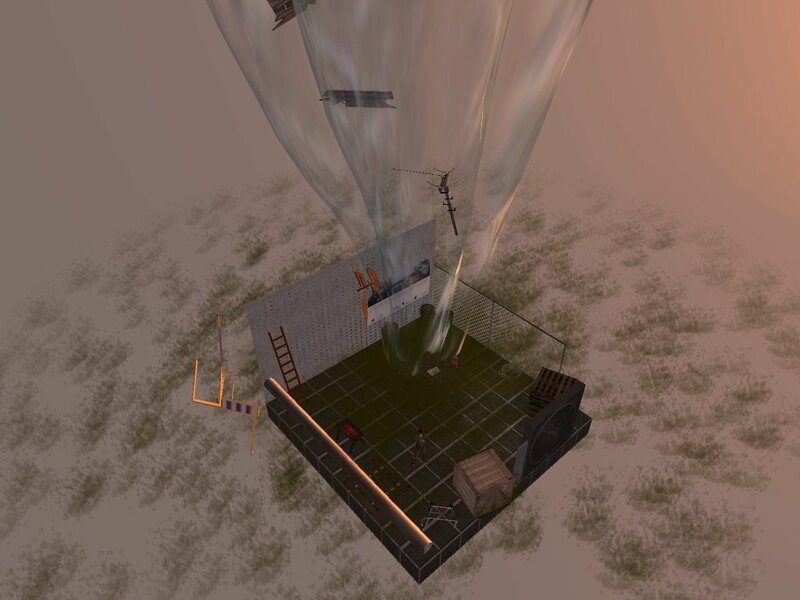 On June 16th, 22 students graduated from the Master’s Program on ICT & Learning (MIL) at Aalborg University, and this is where I’ve been running courses on SL for my PhD-project since 2007. As always, graduation day was an exciting day combining student anxiety and great relief and joy. 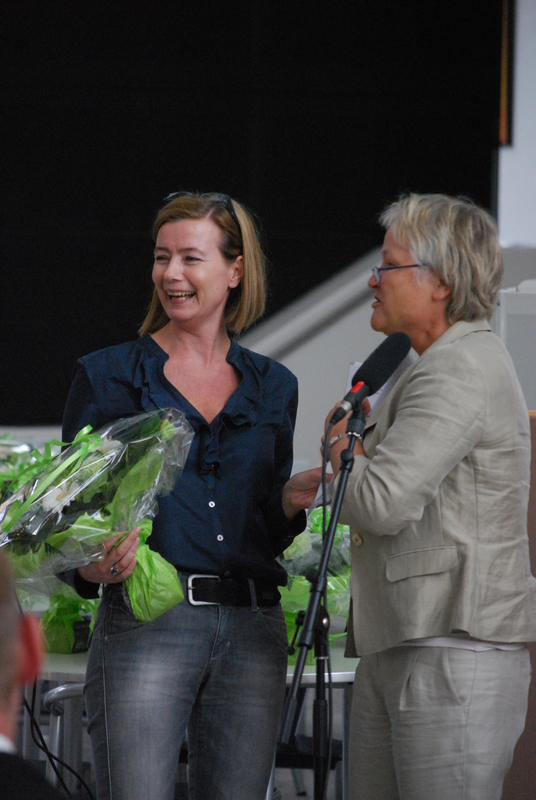 After all the exams, there was a reception where the Masters received their diplomas, the daily manager of MIL, Ulla Konnerup and the Dean of Humanities, Lone Dirckinck-Holmfeld spoke about the students’ achievements and their new roles as “ambassadors of ICT & Learning”. Finally, we finished off the day with a wonderful dinner/dance at the Utzon Center, downtown Aalborg. 22 very happy Masters of ICT & Learning 2011. 1 happy Teacher of the Year 2011 and 1 happy Dean (right). 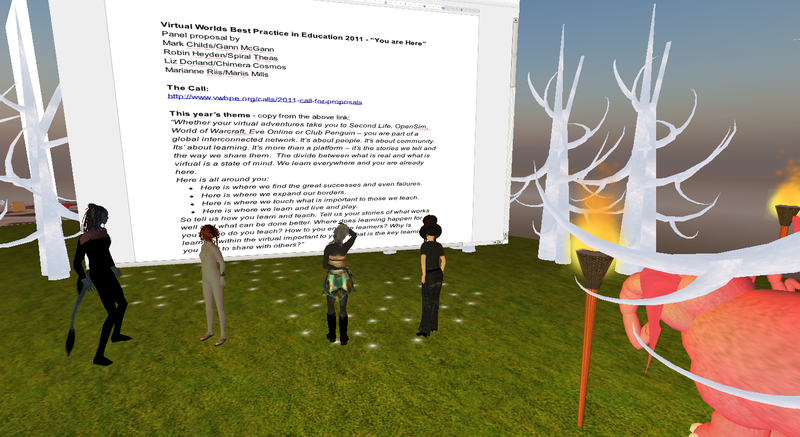 Ironically, I’ve not (yet) seen these particular students evaluations, however, based on the evaluations the students and I did as part of the SL course, I do have a few ideas as to why the students find teaching and learning in SL so satisfying. To understand this a little background information is necessary. In my PhD-project, I’ve conducted 4 research cycles, spanning from 2007-2010. Each cycle consisted of designing, implementing, and evaluating a 6-8 week online course on ICT and instructional design based in SL and a conventional 2D VLE. From a theoretical point of view, I’ve been inspired especially by Wenger’s (1998) social theory on learning as participation in Communities of Practice (CoP), Schroeder’s (2011) ideas on presence and co-presence, and Bolter & Grusin’s (1999) concept of remediation. From a methodological point of view, I’ve been inspired by Insider Action Research (Coghlan, 2007), and ethnographical methods such as longitude participant-observation (Boellstorff, 2008). 53 adult MIL-students (majority are educators) in total have participated in my study. 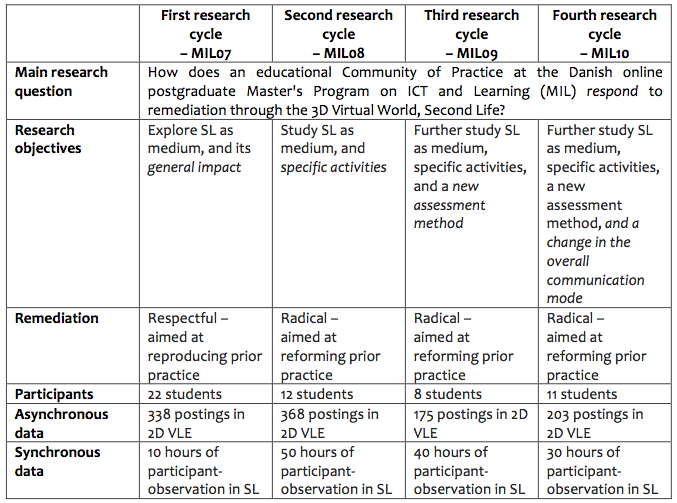 The table below provides a brief overview of the research cycles. Based on my data, I’ve been able to identify 3 analytical units that will inform the answering of my research question; namely what it means to learn via 1) a new, virtual environment, via 2) a new, virtual body, and finally via 3) new, virtual activities. 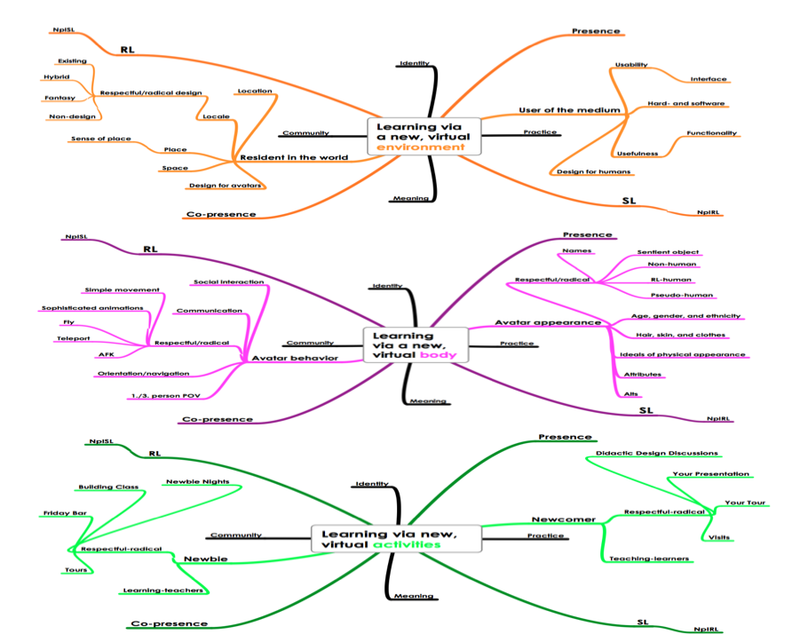 The picture below shows the 3 units and the related topics that emerged in all four research cycles. 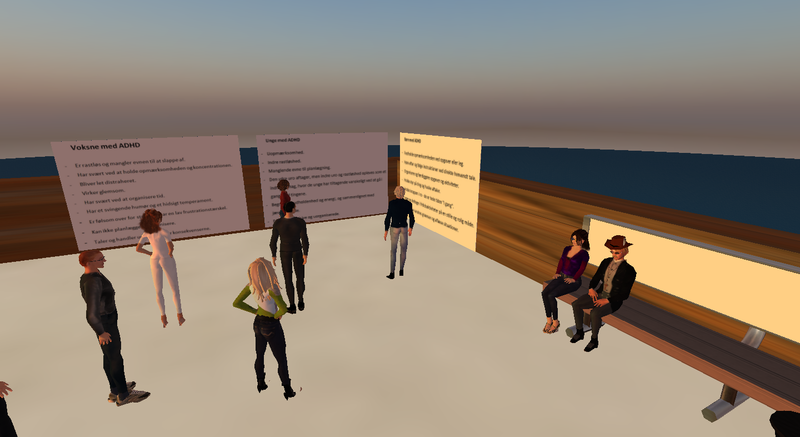 3 analytical units; virtual environment, virtual body, and virtual activities. 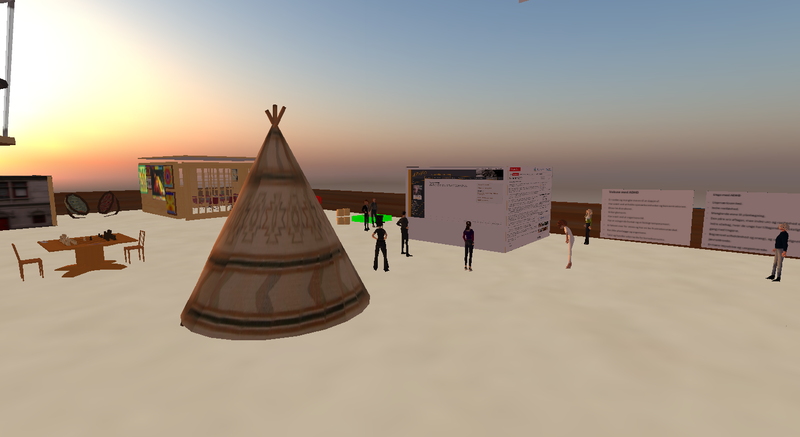 Even though, I’ve not designed exclusively for the creation of a community of practice in SL, e.g. by solely using Wenger’s proposed design principles*, the ideas of the theory are part of my, and the MIL Program’s general pedagogical foundation, and I do believe that SL is a medium that offers very good opportunities for creation of communities of practice, both in educational and other settings. Looking at my data, I’ve found a distinct connection between elements from CoP-theory and presence/co-presence as shown in the figure below. 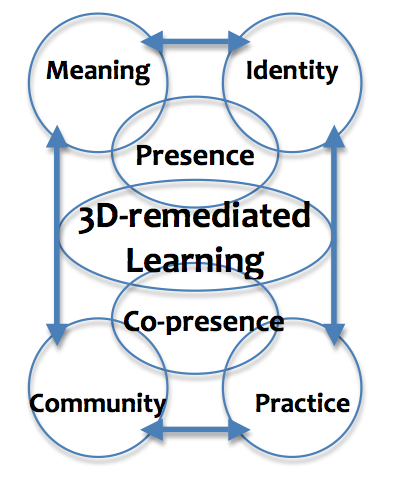 Connected elements of presence and CoP-theory in 3D-remediated learning. 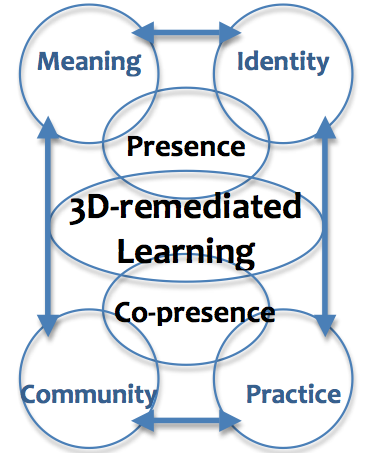 In short, the figure shows how the sense of presence facilitates the creation of meaning and identity, while the sense of co-presence facilitates the creation of community and practice. In practice, the elements overlap, and it is in fact the oscillation between the elements, which constitutes the dynamics of SL as teaching and learning environment as seen from a CoP-perspective. Based on the findings from my study, I believe that the combination of a social pedagogical strategy and the use of a medium that affords a strong sense of presence/co-presence and which is rich in terms of co-creative possibilities, actually can promote student satisfaction. Evidently, this is a very brief description of my work … more details will follow in my forthcoming dissertation that is due in September. *) For an excellent example of integrating Wenger’s principles and ideas in design for teacher development in an online community, please have a look at my (now former) colleague Dr. Mayela Coto’s PhD-work. 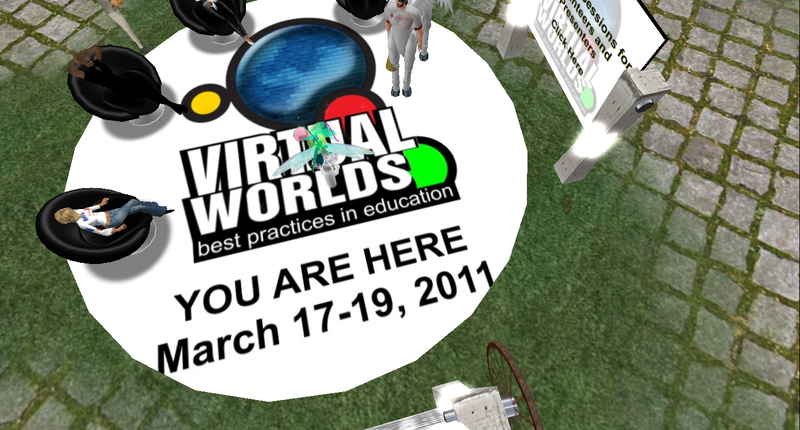 On March 17-19 the 4th annual Virtual Worlds Best Practice in Education (#VWBPE11) will be taking place in SL and other Virtual Worlds such as OpenSim, World of Warcraft, Eve Online and Club Penguin. This year’s theme is You are Here. The divide between what is real and what is virtual is a state of mind. We learn everywhere and you are already here. Here is where we find the great successes and even failures. Here is where we expand our borders. Here is where we touch what is important to those we teach. Here is where we learn and live and play. Furthermore, this year I have the great pleasure of doing a panel discussion together with 3 SL friends and colleagues: Chimera Cosmos, Spiral Theas, and Gann McGann. 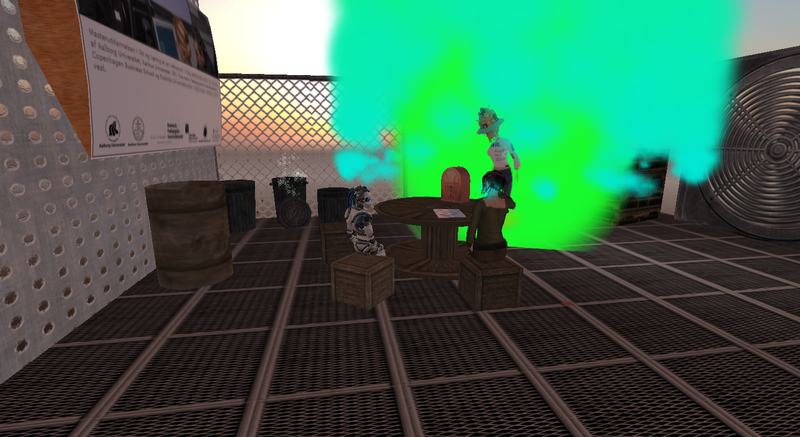 While the user-controlled ability to change both the environment and one’s appearance definitely is an important part of SL, we as educators are also concerned about the kind of activities that can promote, facilitate, and not least sustain engagement in teaching and learning in an environment such as SL. 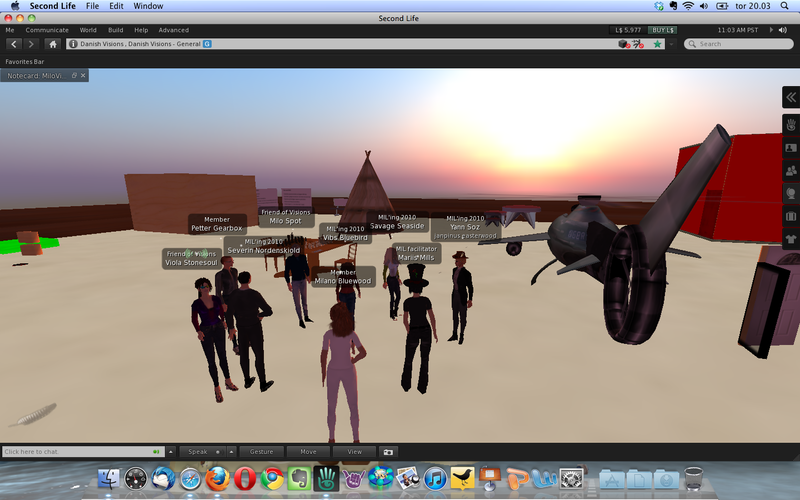 There are numerous barriers to engagement in virtual worlds. First, new residents must become familiar with the interface. Beyond technical considerations, the nature of their early experiences will determine whether and how quickly they will build an identification with their avatar and a reason to stay. Without this, it is likely that their interest in further engagement in the virtual world will lessen and their participation will drop off. A sense of presence and identity through embodiment and immersion is an important contributor to ongoing and satisfactory participation in the world and finding the motivation to continue to return until the technical and navigational thresholds are surmounted. This roundtable will discuss the essential acts, the “ah-ha” or Eureka moments, the triggering gizmos, features, activities or places that inspire students or colleagues (and have inspired us) to continue to participate. In other words, what works to help new residents pass these technical and navigational thresholds? The speakers will share their own stories drawn from their work with students in higher education, business people, health professionals, and education colleagues. Presentations will include demonstrations and audience participation. Also please note that even though the conference is free, you need to register in order to participate via this link. By registering you will be helping the organizers plan out resources to ensure the conference runs smoothly and that there is allocated enough space to ensure everyone gets an opportunity to participate. On Thursday, January 20th Milo Spot and Viola Stonesoul from the “MILOVIOLA” group did their presentation and analysis of SL as teaching and learning environment for pupils diagnosed with ADHD. Both Milo and Viola have previously investigated more general use of ICT as tool for people with ADHD in coping with daily activities, and so were interested in exploring if and how this multi-modal medium could be applied with regards to such a target group. We started off in a sandbox up in the sky, where we were asked to switch to sunset setting, and Milo and Viola made it clear that they wanted to focus on different affordances of the teaching and learning space. In the NE corner of the sandbox, Milo and Viola had set up several display screens with information about ADHD, and Milo gave us a short introduction, so that we could better understand the background for their design thoughts. One of the major challenges for people diagnosed with ADHD is their problem with staying in focus if too many impressions are perceived simultaneously, and in the space depicted below Milo and Viola wanted to show us how multiple impressions could become overwhelming because of lacking ability to filter information – the many pictures sort of “coming toward us” in this space illustrated this point very well. 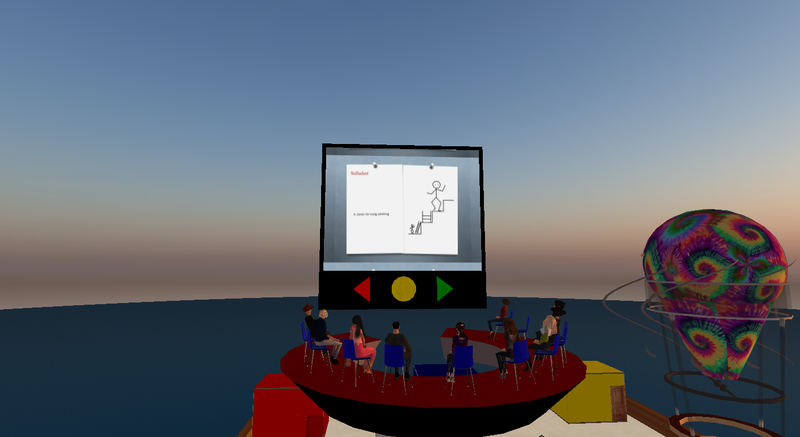 Scaffolding (as depicted in the slide above) was one of the key words in Viola and Milo’s analysis, and in a related manner, they referred to a model illustrating the stages of learners’ participation in virtual worlds created by Dr. Mark Childs as part of his PhD dissertation. Childs visited the class in-world as Gann McGann on January 3rd, and his thoughts on avatar identity, presence, and embodiment really seem to have influenced the students (and me!). Gann McGann and one of his alts visiting the MIL Class. Back on the ground in the sandbox, Milo and Viola walked us through some of the designs/objects they had considered as part of their teaching and learning design for this particular target group. ADHD-patients tend to become frustrated if their daily routines are disrupted, it is not a target group that handles change well, and as an example one of Viola’s pupils demanded there be a clock in a classroom – otherwise she wouldn’t enter the room. Chess with its meticulous rules appeal to some ADHD-patients, and strengthen their ability to stay focused. Many ADHD-patients also need private space, even when in a social space, and the tipi in the background could accommodate this need. In the next part of their session, Milo and Viola divided us into three teams, Red, Blue, and Yellow, and we were asked to enter the similar colored boxes/spaces set up in the south end of the sandbox. We all got note cards with case-scenarios each describing someone with ADHD. Our task in the boxes was to identify learner needs and write them in a shared document. Petter and I writing in the typewith.me-doc that was shared among the 3 groups enabling us to see real time what the other groups were writing. One of the concerns Milo and Viola expressed with regard to using SL in relation to their specific target group was the amount of information that the SL-user constantly is expected to cope with. To exemplify this they asked us to go to a freebie store and see if we could find and buy some doors …. Next stop on the tour was the holodeck on the Danish Vision island. In the setting below ADHD-patients could practice social and communication skills in a safe environment. We ended the tour visiting the Al Andalus Mezquita, which could be used in teaching more general life skill and as a setting for discussing different perspectives on culture, religion, life, and death. 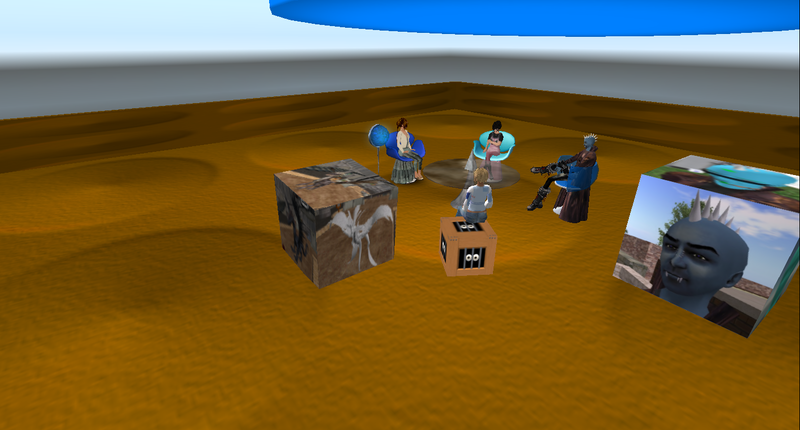 Finally we all went back to the sandbox for the feedback session. 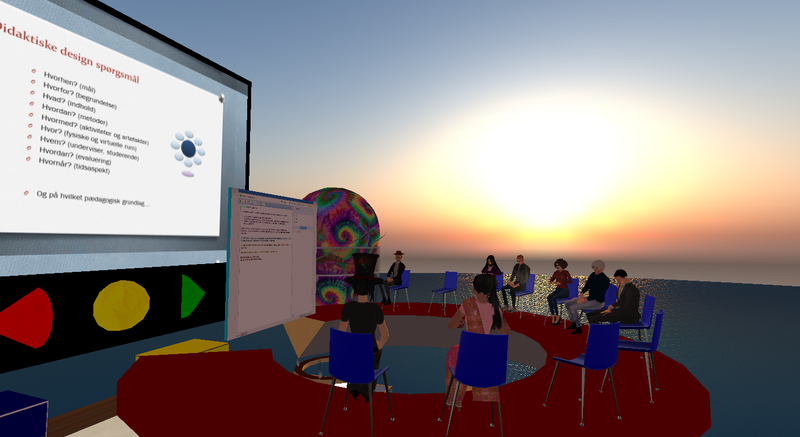 Through this highly packed program Milo and Viola splendidly showed how the space in SL can be transformed into meaningful teaching and learning places, and we all appreciated their effort to use different features in the environment such as audio-visuals and shared media. The connection between pedagogic underpinnings and practical use of the medium was very strong and well reflected. 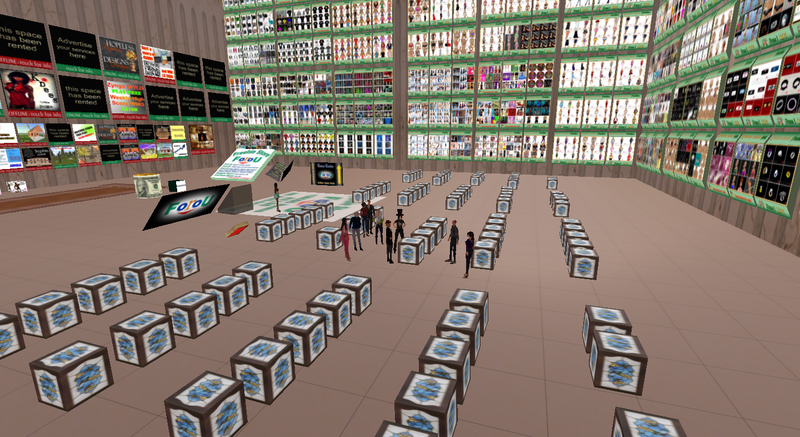 Furthermore, Milo and Viola clearly demonstrated how an educational setting could be designed with free objects found in various freebie shops in-world. 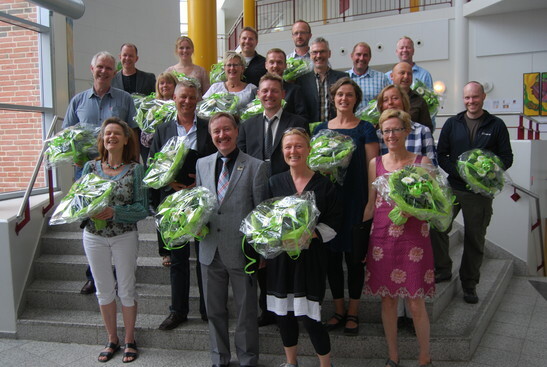 This was the fourth and final student presentation in the course – and I do think that Milo and Viola managed to leave us all with a very good impression of the teaching and learning potentials of SL – not only in relation to ADHD-patients, but in general.